Monday December 7th 1896 weather a little better. Will and I took an early start down to Henry Birds sale. Will got a few things. I helped Ella some with preparing lunch. Tuesday December 8th 1896 I hurried around with the work this morning. Mary & Jennie Woolf were out to spend the day. Will went down town in the forenoon but spent the afternoon at home. I worked on my rags in the evening. Wednesday December 9th 1896 I was very busy with the work all forenoon. Will and I went down town after dinner. I did some trading and stopped at Mrs Reddiks to attend the Aid society meeting till Will called for me. I got a new turkey platter today. Thursday December 10th 1896 It was a very pleasant day. Will and I went over home about nine oclock and he went on up in the country to buy a horse. I walked from home over town to meet him. Elmer and Ida Anderson spent the evening with us. 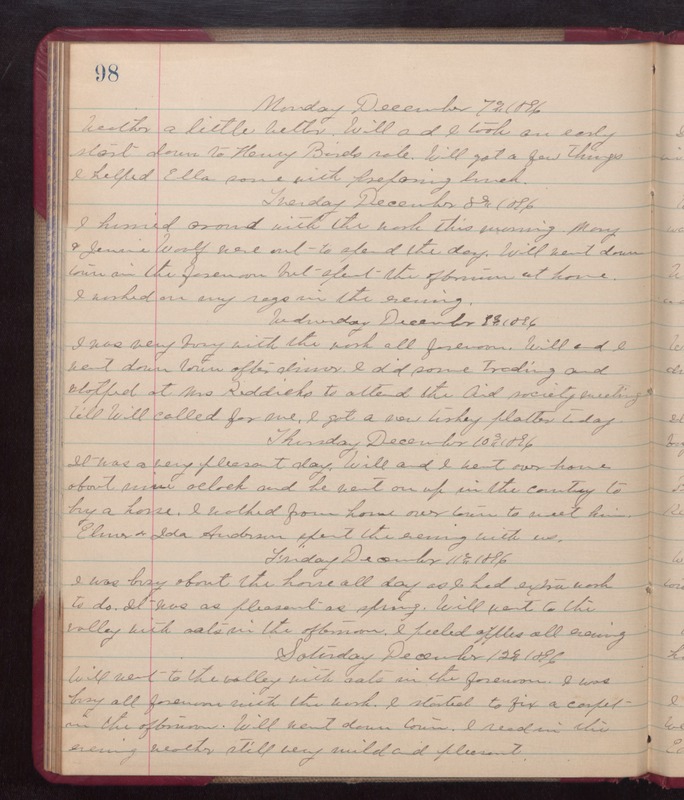 Friday December 11th 1896 I was busy about the house all day as I had extra work to do. It was as pleasant as spring. Will went to the valley with oats in the afternoon. I peeled apples all evening. Saturday December 12th 1896 Will went to the valley with oats in the forenoon. I was busy all forenoon with the work. I started to fix a carpet in the afternoon. Will went down town. I read in the evening. weather still very mild and pleasant.